Last night was my final class at Clayworks for this session. We'll start up the winter classes in January. We fired raku last night and had a potluck supper which was fun. It made for a long night though and by the time I got home it was past 11 pm, late for this guy. So I slept in a bit this morning before making it down to the shop. I cut feet on a dozen plates and slipped a few last minute things I made yesterday afternoon. My brother in law called Monday night wanting to know if I'd make a few shaving mugs for him. So those ended up being the last pots I threw for this load. 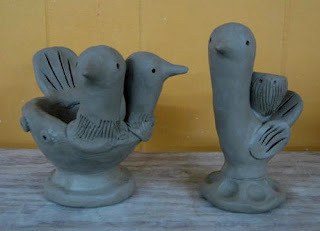 Around mid morning I remembered that Shawn Ireland from Penland had recommended that I make some larger birds. Shawn and his friend, Mike Henshaw, have always made these really great animal sculptures. I have always admired them but have never brought one home. Anyhow, I thought I'd give it a try and here are the results. I am sure I subconsciously borrowed some ideas from those two guys but I also tried to remember and draw upon some images of Mexican figures I'd seen in books. 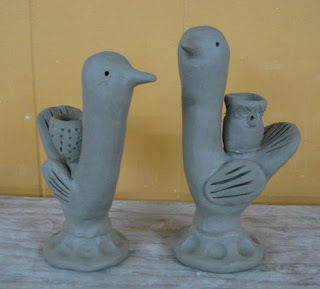 These two long necks (tallest is 7") will get an iron glaze that goes green/amber. 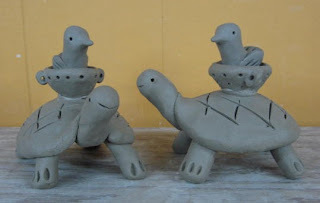 Here are a couple of bird toting turtles. The shells will be amber and the birds will be blue. This double headed bird dish was an off the wall creation. And one more long neck. I also got two racks of clay mixed this afternoon which I am really happy about, that should get me by for a while. It looks like I'll be bisquing on Friday and hopefully loading the kiln on Sunday. I'd like to not be unloading on Thanksgiving like I had to last year. Postcards for the Holiday Sale go out tomorrow!